Equity and Trusts is an ideal choice for all undergraduate and GDL students looking for a comprehensive yet accessible textbook on this complex area of law. The author's clear writing style, plentiful explanations and focus on modern case law demystify difficult concepts and help to bring the subject to life. 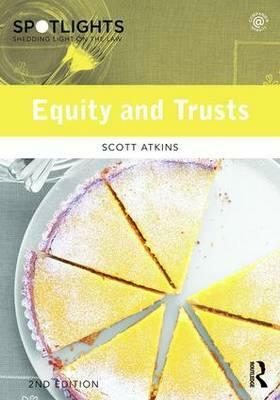 Equity and Trusts is shown to be a live, growing and developing subject, with an important historical underpinning that ensures students gain a sound grasp of key material and understand both its history and current application. Clearly written and easy to use, Equity and Trusts enables students to fully engage with the topic and gain a profound understanding of this fundamental area. "It is a great advantage having the cases dealt with in such detail, yet the box at the beginning of each chapter indicates the key issues so the students know what they should be concentrating on, and the pedagogical features clarify the difficult points." "Undergraduate law students traditionally find equity and trusts one of the most difficult subjects which they have to study. The straightforward and down to earth approach of this book should help to make the subject more accessible and enjoyable. I will certainly recommend it to my students." Scott Atkins is Senior Lecturer in Law and Programme Leader for the LLB in the School of Law and Criminology at the University of Derby. He is also Visiting Professor at the Institute of Law in Jersey.